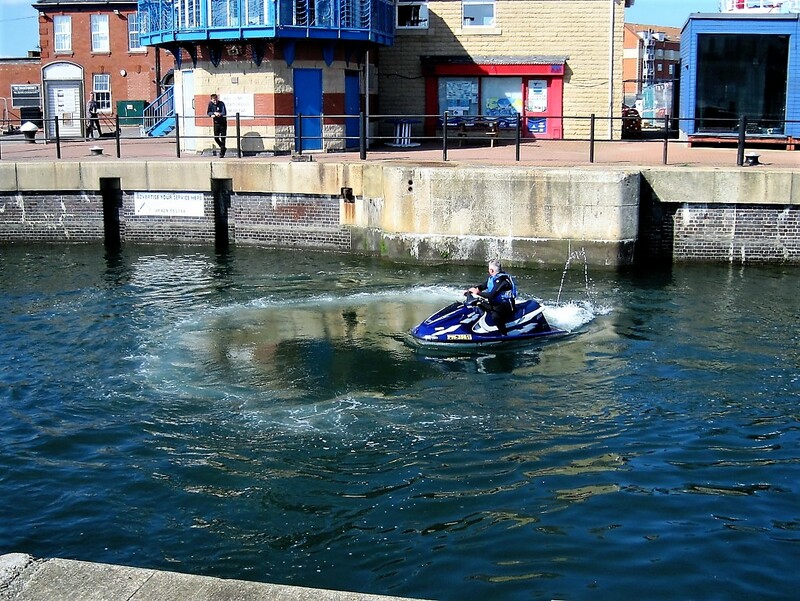 There’s always Liquid to be found when you live on the coast, but it’s not every day you find a jet ski showing off inside the lock gates. This view is a constant, though… so long as the sky is blue! Wishing you a happy day, whether you spend it watching Harry and Meg, outstanding tennis, the FA Cup final or none of those. The one thing you must do is share Six Words with Debbie. Never been on a Jet Ski but it looks great fun. Love to have a go but might end up showing off like all of the others I think. Nor me but I’ve watched our son a time or 2. Happy Sunday Jonno! It’s been a wonderful weekend and yes, I watched the wedding – well, until just after the vows! I then had to pick my son up from work so missed the kiss! Garden viewing for us too today and saw the most amazing geese; some rare red-breasted ones! Stunning! Hope you had a good one as well! You make me long for water. Maybe I need a walk along the Wisła. The composition of those last shots is stunning. This time in two weeks I’ll be awaiting you! Never on Sunday! But maybe some time next week, between twin overnightings! One at a time. A lazy day with a lunch date later? And what pleasure to look forward to! They won’t want you to go home again. But too early to think that 🙂 🙂 Have a lovely day, Meg! The sun is sparkling again and we’ll be off to a garden later. I shared my liquid post on Wordless Wednesday. 🙂 Water is a versatile thing! No TV for me this weekend; I’d rather be outside, since during the week, my computer expects my attention. Have a nice and royal weekend, Jo! I’ve always liked the saying “whatever floats your boat”… and, though not a real boat, it looks like his is floating! Have a super weekend. No idea if they’re showing the wedding here. We don’t even own a TV. Can’t say I miss it. Simon and Garfunkle (if you remember them) said “I get all my news from the weather report”! Much of the murder and mayhem still manages to leak through even if you don’t intentionally watch it. Yes, I’m here, writing my walk for tomorrow and trying to ignore distractions. 🙂 🙂 The sun is sparkling and that’s distraction enough. I shall be breakfasting in the garden in a little while. Rafael Nadal, native of Majorca, whose tennis highs and lows I’ve been following for the past 10 years or more. He looks like he’s having fun! Hope you have a good weekend, Jo! That jet ski guy made me smile, Jo. No wedding for me, as I have to work rather early (and long), but when I get home, I’ll watch the Preakness and then another round of the Stanley Cup playoffs (ice hockey’s big event and I do love hockey.) Right not, just hoping to get through the work day without any big crises! What’s Rafa? Sounds like a delightful time for you, Jo. Enjoy the garden!!! What will you come up with next? A jet ski? In Hartlepool? Prefer the pier shots, they are lovely. Have a lovely day, I hope the sun is shining. We’re off to the Potager for lunch, hoping everyone else is busy watching the wedding / footie!! I often feel like that when I get up in the morning! 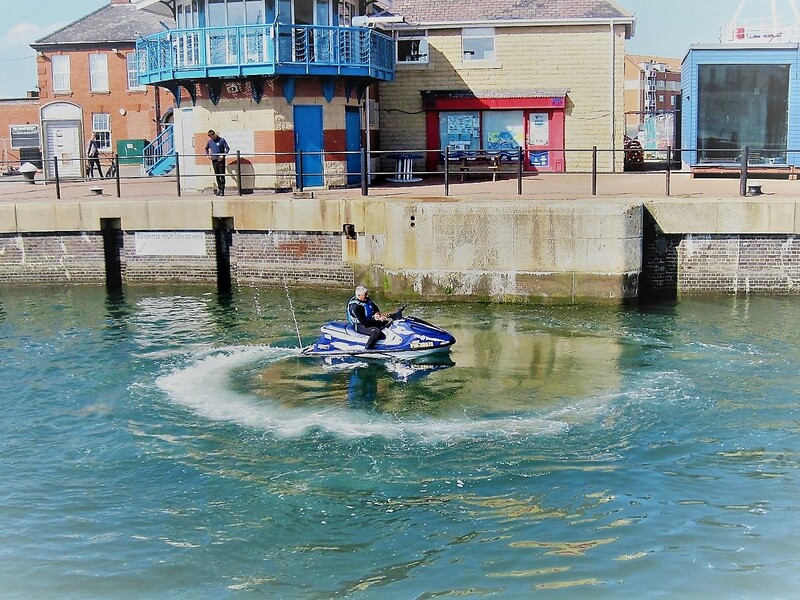 I was watching a couple of jet skiers showing off yesterday, a form of synchronised jetting, with double flips and wibbly wobbles. It went with the song 🙂 🙂 And I liked the spun reflections. A guy with mid life crisis? !